Every human being, no matter how ‘ignorant’ or submerged in the ‘culture of silence’ he may be, is capable of looking critically at his world in a dialogical encounter with others. Paulo Freire, ‘Pedagogy of the Oppressed’, 1972, p.12. 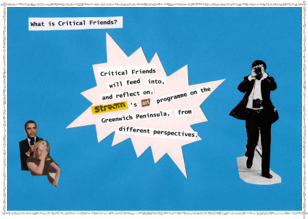 Critical Friends are a group of residents living in North Greenwich, London, UK who meet to research, critically reflect and feed into the development of socially engaged art commissions. Since 2008 Critical Friends have included: Rachel Gibson, Arthur Hayles, Anthony Nicolaou, Bre Stitt, Dave Sharman, Rich Sylvester, Ann Webb and Ellen Willis. Critical Friends was facilitated by Rebecca Maguire and Sophie Hope from 2008-2011. 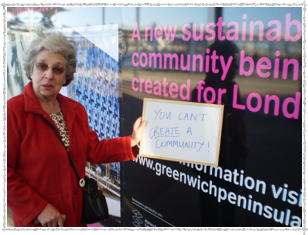 This website hosts the Critical Friends Magazines which document some of their research into socially engaged art on the Greenwich Peninsula. Critical Friends was commissioned by Stream. To read Sophie’s Logbook of Critical Friends click here. 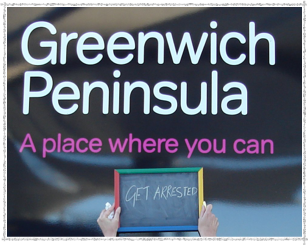 ‘Critical Friends’ began with an invitation Sophie Hope received in 2008 from Stream, an arts organisation based in North Greenwich, London to evaluate a series of public and collaborative art commissions called Peninsula from 2008-2011. In response to this invitation, Sophie and her colleague Rebecca Maguire developed an alternative proposal and established a small group of participants of past and present Stream art projects to devise the questions they wanted to ask of the role of art in the neighbourhood. Critical Friends became the participant observers and evaluators of the projects themselves. Stream allocated the money reserved for the evaluation of Peninsula (£5,000 of the total budget of approximately £90,000 from the Big Lottery Reaching Communities Scheme) to the Critical Friends which went towards paying Rebecca and Sophie to organise and facilitate the workshops and the photocopying of a magazine to document our findings (online versions are available on this website). 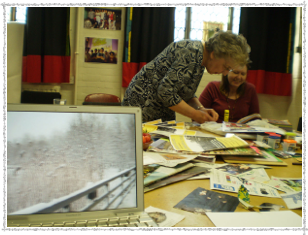 From 2008-2011 Rebecca and Sophie hosted monthly workshops at Stream and a group of ‘Critical Friends’ has evolved. The workshops consisted of between 3 and 7 local residents who were recommended to us by Stream and had some prior knowledge of Stream’s work, mainly as participants in past projects. While a core group of 3 ‘Critical Friends’ has been established, other people come and go from the group depending on other commitments. The group has evolved as an experiment in collectively deciding who, what and how art commissions are researched and evaluated and has involved the Critical Friends interviewing commissioned artists, staff of Stream, a Board member of Stream, recording responses from neighbours, visiting other examples of commissioning art (for example, the South London Gallery) and observing and participating in the projects themselves. There has also been an ongoing process of the group constantly rethinking and questioning the role of Critical Friends as a project itself. The group describe their work as “developing creative ways of investigating, critiquing and feeding into the commissioning of public and collaborative art, specifically in relation to Stream’s ‘Peninsula’ art programme” (’Critical Friends’ 2009). A self-made photocopied magazine and monthly workshops have been sites for the writings, documentation, performances and presentations created by the group. Through the workshops we have been identifying questions to ask of the commissioning process, reflecting on what it means to ‘participate’ and trying out different ways of evaluating public and collaborative art from the perspective of participants. The magazines aim to communicate some of that research so that it can feed into the process of commissioning, producing, critiquing and participating in public and collaborative art.